To Prevent Aggression Off The Pitch, Jerusalem Takes Aim At Teams' Purses : Parallels City officials are getting tough on the soccer field — by cracking down on fan behavior, especially anti-Arab actions. If fans are racist or violent, the teams they support will pay the price. 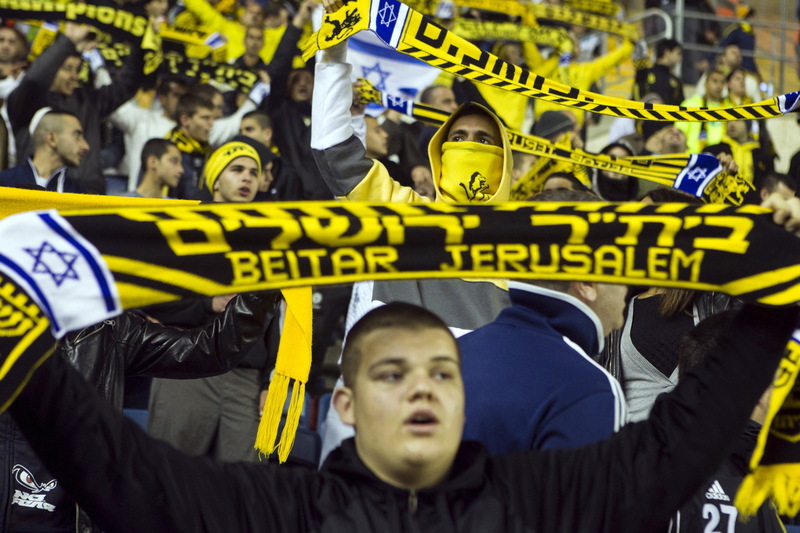 Fans of Beitar Jerusalem, often known as La Familia, hold up scarves during a match against Bnei Sakhnin at Teddy Stadium in Jerusalem. With a reputation for aggression and racist behavior, La Familia has come under the scrutiny of city leaders. Israeli security forces are struggling to contain a recent wave of violence between Israelis and Palestinians that has erupted across Israel, the West Bank and Gaza, killing more than two dozen people in less than two weeks. The government is deploying more security forces to areas of conflict, including Arab towns in Israel. But shortly before this recent escalation began, city leaders in Jerusalem decided to try a new way to fight the separation and mistrust between Jews and Arabs, who constitute about 20 percent of all Israeli citizens. Their efforts are focused on the soccer field. They say too many Israeli fans exhibit racist and violent behavior, particularly toward Israel's Arab fans and players — and city officials also have a solution: Take public funding away from teams associated with such behavior. Their main target is Beitar Jerusalem, the country's most popular pro team, with a fan club that calls itself La Familia. They are an aggressive group. At a recent game, city leaders warned me several times that fans sometimes beat up reporters who want to ask them questions. Their cheering section had a lot of 20-something men, but also teens and some middle-schoolers with their dads. Sixteen-year-old Itai Ben Avi, one of the few fans who agreed to talk, said he's disappointed with the city's plan, which could take away over $350,000 per season per team, according to city officials. "It's sad that they're going to try to take funding from us," he said, standing outside Jerusalem's Teddy Stadium in a black sweatshirt with the emblem of La Familia. "And they're probably going to try to force us to hire an Arab player." Ben Avi says the racist label has unfairly stuck to Beitar fans. But the team is the only major league soccer team in Israel that has never hired an Arab player. Two Chechen Muslims were brought on briefly in 2013, to the wrath of some fans. And three La Familia members were recently charged with brutally beating the fan of another Israeli team. La Familia's racist and violent reputation goes beyond soccer. Last week, with violence increasing in Jerusalem, many marched through city streets shouting "death to Arabs," which they also shout at games. Beitar Jerusalem fans watch a State Cup soccer match against Maccabi Umm al-Fahm F.C. at the Teddy Stadium in Jerusalem. 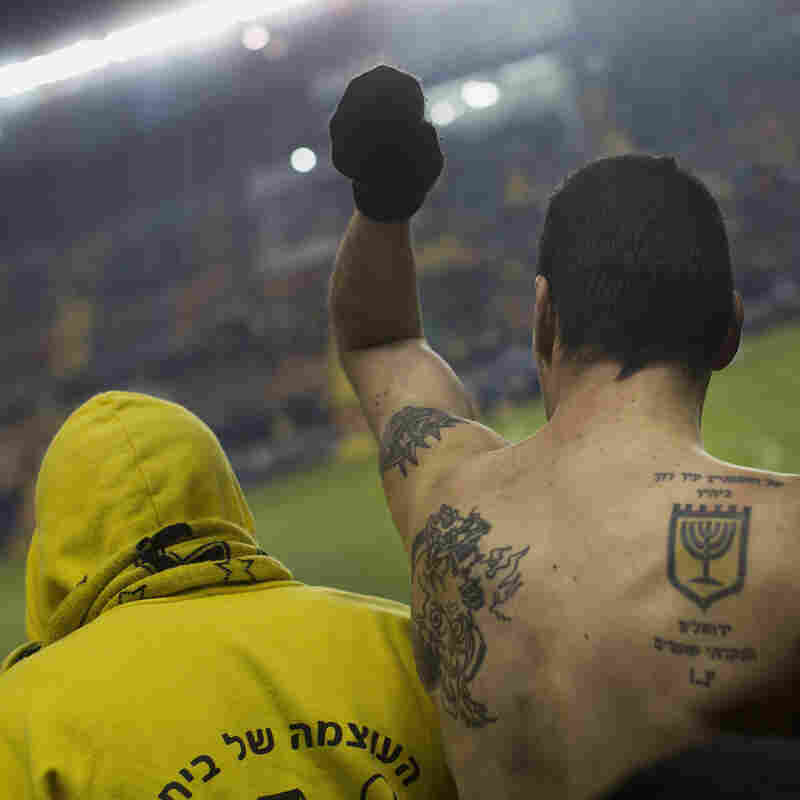 The right tattoo shows the Beitar Jerusalem logo and reads, "I have set watchmen on your walls, Jerusalem; they shall never hold their peace day nor night." The fan group's members at the march, like those at games, were suspicious of the media. Yossi, a young man who refused to give his last name, said La Familia marched to show support for Israel. A friend with him said it was "sad" that a sports group was the one to organize the march. But critics say La Familia's behavior embarrasses Israel. Last season, referees cited Beitar with more incidents of racial taunts than the rest of the league's teams combined. Jerusalem city council member Hanan Rubin sponsored the bill to make public funds for sports teams contingent on fan behavior. He says Beitar fans are so aggressive no one wants to stop them. "Not the team, not the owners, not anyone else," he says. "So we have decided to do it ourselves." Khalid Khalaliya, the captain of a mixed Jewish-Arab team from Sakhnin, an Arab town in Israel, has heard plenty of insults from Beitar fans. "They say lots of racist things," Khalaliya says. "They have called me a terrorist, by name. Sometimes they curse the Prophet Mohammad. But it just makes me want to play better and win the game." Khalaliya, 32, likes Jerusalem's plan to take away funding as a way to improve fan behavior. But Sakhnin's spokesman, Munthir Khalaya, does not. "That kind of such a punishment won't change the behavior of the fans," Khalaya says. "But any financial punishment will weaken the team." A relatively new Jerusalem team offers another way to change racist behavior. Hapoel Katamon Jerusalem is owned by its fans. Manager Shai Aharon says the team's youth program regularly brings Arab and Jewish kids together. They are invited to train together, rather than play against each other, he says. "We make them be together, not one against each other. So they understand the 'other' side is not the other side," he says. Aharon says very difficult to make an impact but he's just trying for a little bit of change. "We are not trying to change the world," he says. Kobby Barda, spokesperson for the Israeli Professional Football League, says Arab-Jewish separation is changing in Israeli soccer. His organization doesn't keep statistics, but he sees ever more Arab premier league players — especially as lower-income Arab-Israeli families view soccer as a way to move up, he says. "I'm not a demographical Ph.D., but you only need two eyes to understand that there is a serious change within the professional leagues of Israel," he says. The first budget cuts from Jerusalem against racist or violent teams will begin when behavior tallies are in for this season. Whatever change that makes will play out against the backdrop of the larger conflict.